Eltronicschool. - This is one a book that will give you information about electronic circuit analysis and practice in this time. 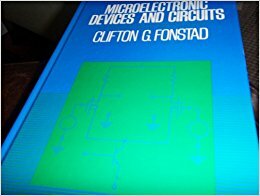 This book is titled with Microelectronic Devices and Circuits that written by Clifton and G. Fonstad. In this time, we will give you global description about this book and then we will give you the link to take free download Microelectronic Devices and Circuits by Clifton G. Fonstad from external server. Combining semiconductor device physics and modeling with electronic circuit analysis and practice in a single sophomore/junior level microelectronics course, this textbook offers an integrated approach so students can truly understand the interaction between semiconductor physics, device structure, and integrated circuit design and operation. The balanced, modular treatments of bipolar and MOS devices, and of analog and digital circuits can be easily adapted to a particular instructor or class’s needs. SPICE models, MESFET’s, optoelectronic devices, worked examples, and end-of-the-chapter problems further enhance the text. This book is based on the textbook Microelectronic Devices and Circuits by Clifton G. Fonstad, which was published by McGraw-Hill in 1994 (ISBN 0-07-021-496-4). McGraw-Hill has declared the original textbook “out of print” and has transferred the copyright to the author, Clifton G. Fonstad. Errata in the original text identified as of August 15, 2006 have been corrected in this edition. This edition will appear enlarged 110% from the original page size when printed on standard letter paper (8.5” x 11”). And now you can click the link below to take free download e-book of Microelectronic Devices and Circuits by Clifton G. Fonstad from external server easily now.